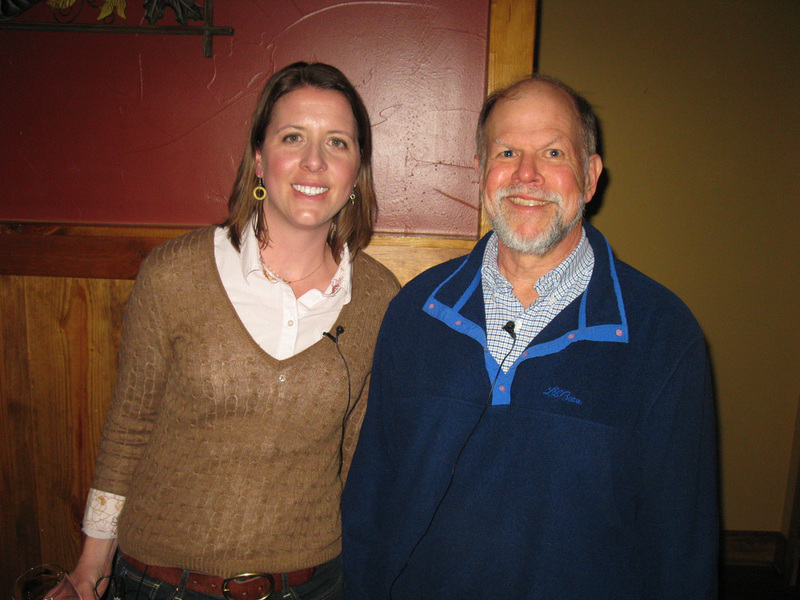 A healthy crowd packed Minocqua Brewing Company’s Divano Lounge April 3 for Science on Tap. The topic was fisheries. “Hook, Line and Thinker! The Science Behind the Future of Recreational Fishing in the Northwoods,” was the presentation. Steve Carpenter, director of the UW-Madison’s Center for Limnology and Gretchen Hansen, post-doctorate UW-Madison fisheries researcher, gave the presentation. Trout Lake Station research scientist and aquatic biologist Susan Knight served as discussion moderator. “We want to talk about the future of fishing,” Carpenter told the gathering. He started out by reviewing he past. He pointed out that these years of events influenced what we see today, and that what’s happening today will affect the future. He said the discussion would be about the impact on the lakes a couple of generations down the road. Hansen discussed likely effects of climate change. A shorter length of time with ice on the lakes will have an effect, too, she said. “It can mean fish are spawning earlier ... and it can mean that the timing of when young fish head out doesn’t match up with the food that they eat,” Hansen said. A change in climate likely means precipitation patterns will vary more widely, Hansen said. She noted the long drought we are just emerging from and its effects on the fishery. “Drought reduces habitat for fish ... It reduces spawning habitat when the water goes down and the spawning habitat is left on dry land, that habitat is not available to them,” Hansen said. “It also reduces things like the fallen logs in a lake that they might use for refuge from predators. She noted some of our aquatic invasive species (AIS) and said that a warmer climate would lend itself to more species not normally native to the area taking hold. A growing and moving human population also makes it more likely that species will be transported to new areas, she said. “Resilience is the ability of a fishery, actually any natural resource system, to maintain itself despite unpredictable changes,” he said. Specifically, areas to spawn, prey to eat, and wetlands to improve and maintain water quality. Good habitat means populations are in a better position to rebuild if they are hit by a “catastrophic event,” Hansen said. She said well-preserved systems that aren’t over-pressured by anglers and haven’t lost a lot of habitat seem to be more resistant to AIS. “For example, my research has shown that in lakes around here that have the high populations of panfish, like bluegills and pumpkinseeds, if rusty crayfish get into those lakes, those panfish may be able to consume enough of them to keep them at low numbers and prevent them from having the negative effect that they have in other lakes,” Hansen said. Good habitat protects in other ways, she said, by minimizing impact. Wetlands can act as a buffer when we have extreme rain events by absorbing and filtering water and also help to regulate water temperature. Carpenter said “heterogeneity” is important. Simply, fisheries should differ. “Having a wide variety of shapes, water colors, depths, areas, and fisheries on a landscape. And regulations, actually. So if a disease outbreak affects one particular fish species, lakes that lack that species will not be affected. So, heterogeneity builds a buffer against that disease,” Carpenter said. “If climate change or habitat loss decreases the production of one game fish species, there will be other game fish species that might thrive. So, again, it’s a buffer against that climate change-induced loss. Hansen said monitoring the fisheries is important. She talked about comparing the present to the past. “To manage something like a walleye fishery, we need to know something about how many walleyes there are in a lake, how that compares to past conditions – are they going up, going down, staying the same? – and how close that number is to what we might ideally want,” Hansen explained. She also noted how monitoring has shown a downward trend in panfish size over a number of years – something that would have gone unnoticed had it not been monitored. It’s not just managing the fish we like to catch, though. “If we see a decline in a sport fish population, but we haven’t monitored anything about water quality, or habitat, or invasive species, or angling pressure, it’s going to be hard to know what caused that decline, and therefore hard to know how we could do something about it if we wanted to,” Hansen said. She said it’s also important to monitor to learn what efforts are working and which ones are not. Carpenter said it’s a changing world, and management methods from the past might not work for our fisheries going forward. “Maybe we’re going to need to invent some new ways of managing fisheries and try them out,” Carpenter said. He talked about a project involving rusty crayfish in Vilas County’s Sparkling Lake. Both he and Hansen worked on the project, aggressively trapping the invasive crayfish. He also talked about the ongoing walleye study on Escanaba Lake in Vilas County. The study has been going on since the 1940s. “And that experiment has shown how walleye populations respond to different fishing pressures and has been an extremely valuable study for learning how to manage walleyes,” Carpenter said. Changing regulations and monitoring the effect of the changes is another approach. Carpenter said monitoring efforts are often the fist thing cut when there’s a budget crunch, and compared such cuts to driving near a cliff in the dark and deciding to shut off the headlights in an effort to conserve battery power. The comment drew chuckles from the crowd. Asked to elaborate on AIS in the fisheries, Hansen discussed rusty crayfish and rainbow smelt. She said “rusties are known to cut down all the aquatic plants in a lake” removing habitat for certain fish and fishing areas. “When smelt get into a lake, they have a very strong negative effect on walleyes,” Hansen said. Walleye natural reproduction is affected, she said. Carpenter discussed the Crystal Lake Mixing Project, where efforts are made to mix lake water in an effort raise the temperature of lower, cooler depths that rainbow smelt prefer in the summer. “Our estimates of the mortality range from 50 to 90 percent,” Carpenter said. The project will continue this coming summer. Carpenter said the warmer temperatures are tolerable for the native fish (crystallakemixing.com). The invasive aquatic plant Eurasian water milfoil (EWM) often came up in the discussion. Some worried it could continue to be transported by boaters. Susan Knight discussed monitoring boat landings. Boaters have to clean their boats to assure they’re not transporting weeds from lake to lake by law. “It’s well established now that it’s against the law and that people can be arrested for it,” Knight said. Knight and Hansen both advocated continued educational efforts concerning EWM. Concerns about the chemical treatment of EWM were expressed as well. Knight said there are ongoing efforts to monitor the presence of the chemical 2, 4-D, which is commonly used to kill EWM, in lake systems. The chemical is best used in early spring to lessen its impact on native plants, Knight said. Asked to comment on walleye/bass interaction, Hansen said in many lakes bass populations are on the rise while walleye populations are going down. It’s not happening in every bass/walleye water and the causes are unknown, she said. Science on Tap-Minocqua is a partnership of the UW-Madison’s Trout Lake Station and Kemp Natural Resources Station, together with the Lakeland Badger Chapter of the Wisconsin Alumni Association, the Minocqua Public Library and the Minocqua Brewing Company. Science on Tap is held the first Wednesday of each month at 6:30 p.m. The next Science on Tap, May 1, will feature a discussion on loons with DNR scientist Mike Meyer. To learn more about Science on Tap, go to www.scienceontapminocqua.org. Craig Turk photographGretchen Hansen (left) and Steve Carpenter presented “Hook, Line & Thinker! The Science Behind the Future of Recreational Fishing in the Northwoods” at last week’s Science on Tap.